A postcard used by TWA in the 1940's to advertise its service. The postcard was based on an actual picture taken in front of the original Albuquerque Air Terminal. One of Western Air Express's Fokker F10's sits waiting for passengers at Oxnard Field...Albuquerque's first Air Field, in this picture from the late 1920's. Early TWA Lockheed Constellations ("Connies") sit at the original Albuquerque Air Terminal waiting for passengers to board in this picture from the 1950's. Charles Lindbergh makes a stop along the way on his Goodwill Tour in September of 1927 near Santa Fe, New Mexico. The New Mexico Air Guard flies formation in the F-80 (the NM Guard's first jets) over the skies of New Mexico. For information on the New Mexico Air Guard visit here. Pilots were trained to learn to fly the new four engine B-24's out at Kirtland Air Force Base courtesy of TWA's 4 Engine School during World War II. For more information on New Mexico aviation during the War Years visit here. A lonesome F-16 from the New Mexico Air Guard sits in a glorious Albuquerque sunset not long before its retirement from service around 2008 - 2009. For information on the New Mexico Air Guard visit here. 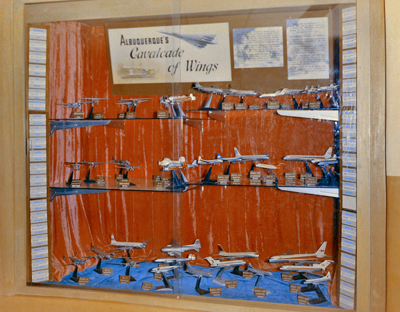 Anyone who has flown into or out of the Albuquerque Sunport Terminal may have noticed the Cavalcade of Wings display of 1300 models in 18 glass enclosed cases. This display, if the visitor has the time shows the history of aviation that has happened to the Albuquerque area from first Balloon flight in 1882 to what is currently taking place today. The collection covers the history from the private, commercial, military, space and all phases of aviation. Just about everything that flew in the air came through Albuquerque at one time or another. The display captures this history through a large collection of high quality built replicas in miniature of aircraft that had an impact in Albuquerque's aviation. Most of the models on display are painted and marked in the livery of how the real plane looked when passing through here. The display also incorporates a large collection of aviation memorabilia. The Cavalcade of Wings is possibly the largest collection of one city's salute to the history of it's aviation that can be found anywhere in the world. This collection is here today only because of one man's unrelenting determination to represent and educate the public of its rich aviation history. The collection was started back in 1965 by Harry Davidson. Harry was at the time a Navy pilot starting on his return to being a civilian. Harry, as a kid growing up in Clovis, New Mexico, became involved in flying with his father. Like a large group of kids at the time Harry started to build models of airplanes. Going to the airport with his dad he asked if the airport would like to display his models. That was in 1958. In 1965, Harry approached the Airport Director Clyde Sharrer of the newly completed Sunport Albuquerque's new airport terminal. He asked if he could start a display of models showing the history of Albuquerque's aviation. The response was given an okay but the cost was up to Harry to provide. Harry, through his unrelenting pursuit in finding the funds and people to help in building models and providing other support services, which has got the collection to its current state and can be seen today at the airport. 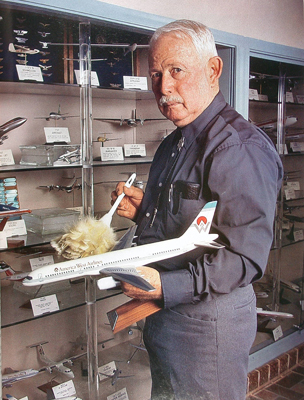 This web site is a salute to Harry Davidson and his determination to preserve and help carry on the rich aviation history of the Albuquerque area and around the whole state of New Mexico for future generations to know. The display, from its first conception has moved around the airport terminal through the years as it kept growing in size. The picture shows how it looked back in the 70's. The collection is currently located on the Northwest side of the second level in what is known as the "Great Hall" going up to the gates. If you have a chance to view the collection you will be in for quite a treat. Each model in the display has a number listed on its title card. Using the Model ID #, this site will give the viewer more of the information on that aircraft. If you have any information that you would like to share on New Mexico aviation history with us please respond to our Contact Us here or above.